Sometimes, I get a bit…impulsive. Always, I get a bit too excited for Halloween costumes. Well, put them together and what do you get? Just an average Jo, who thought it sounded like a fantastic idea to take her two young boys to IKEA, merely to get that ONE last item to complete her family’s costumes for the year. Come on, now. IKEA…with two children….for one.stinking.item. A black umbrella, to be exact. IKEA had the perfect umbrella for only $2.99, so obviously it was going to be a worthwhile trip. Sweet little gem. I plopped my boys into the cart and felt confident, once again, in my decision to make the most worthless errand ever known to man. As we headed away from the dank corner and back towards the arrows, I felt the cart tugging me to the right. Huh, that’s funny, I thought. Must be because Jude is getting so big; these carts are probably not meant to carry such a large child, I rationed. However, after passing a couple of arrows, I realized something was desperately wrong with my beloved cart. I was compensating for the pull to the right so much that I was getting a backache, and somehow, it seemed to be getting worse as we strolled slowly ahead. 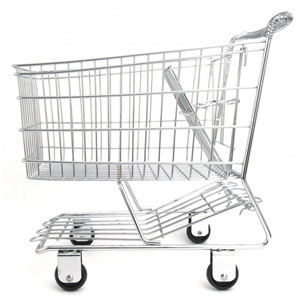 My eyes were darting to and fro, searching for a new cart, to no avail. After careening into three displays and nearly colliding with two pairs of elderly folks, I decided I needed to make a change. I tried pulling. I tried going backwards. I tried standing on the right and pushing with my body weight. And then I did the unthinkable. I turned the cart sideways. It floated along the floor like it was born to be pushed sideways. Are you kidding me right now. This is so humiliating, I grumbled audibly. I did the “grapevine” next to my sideways cart for about 984 arrows. (Okay, maybe not that many, but you get it.) Around arrow #430, I started laughing with my kids, who were clearly amused. It was quite a ridiculous situation and it deserved a tidbit of laughter. Now, if you do not have small children, you are undoubtedly thinking, why not just ditch the stupid cart and walk?? If you DO have small children, you will know…that is NOT AN OPTION. Especially not at IKEA, where you cover the same distance on foot as you would to walk to Sweden, where you could meet the designer of the umbrella that costs only $2.99. As we pressed on, we passed a couple who looked at me quite curiously, so I quickly explained that the cart was broken and I had to push it sideways to avoid injuries. And there was much laughter. “Would you like me to take a picture so you can see how ridiculous you look?” the lady asked. I declined. Later on, our sideways adventure was on my mind. I realized that sometimes my life as a mom feels kind of “sideways”. The more I try to push forward and conform to what other moms say is the “best way”, the more resistance there is. Once I give in and go against the grain of what everyone else is doing (or not doing), it often works better for my little family. 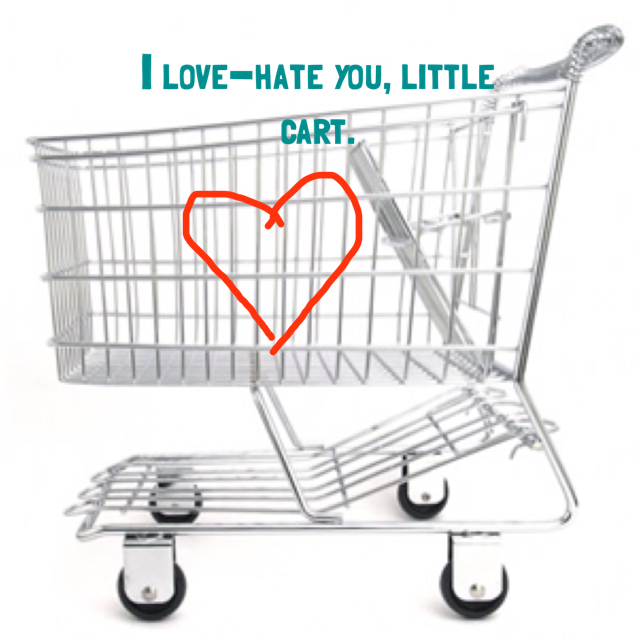 The second lesson my shopping cart taught me about motherhood is this: stop being so uptight. I spent the first half of our time together feeling embarrassed and pissy. Once I lightened up, we were able to laugh together. I would have missed an opportunity if I wouldn’t have changed my attitude. Everything doesn’t have to go smoothly all the time. In fact, life would be pretty dull if everything always went the way we expected it to. My life in process looks like this today…accepting the sideways days, and then turning myself so that I can go sideways right along with them. I hope you have a sideways day today, too. What a great post! Thanks for the giggles imagining you and the boys and the sideways cart. 😉 Loved the mothering parallels. You’re an encouragement to me!